2018 was an incredible year for OfficeRnD. We grew 4x in pretty much every business KPI but what really excites us is how much ‘product’ we delivered in 2018. Of course, we have bigger plans for 2019. Our team is heading north of 40 people in total (20 strong of them working on the product!) which will result in a lot of great improvements and new functionalities. 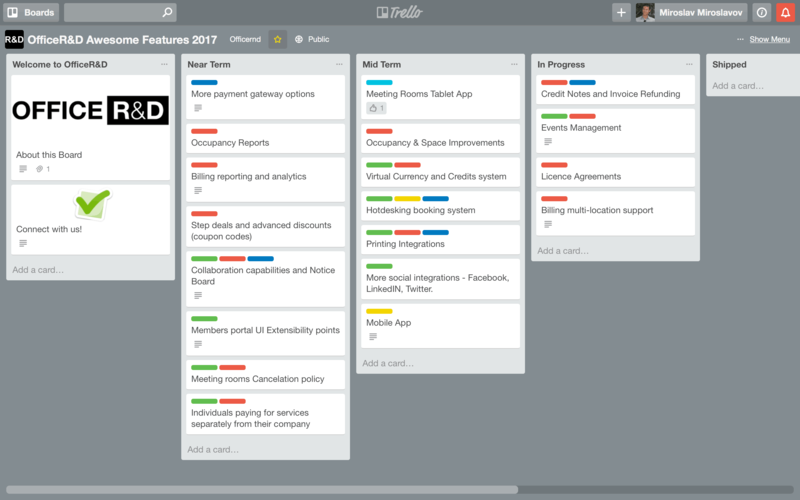 After lots of conversations, brainstorming sessions and customer discussions, we created the first version of our Roadmap for 2019. Being the easiest to extend and onboard platform. Being the easiest to use, yet most advanced coworking management platform motion is focused on maintaining and improving all the current functionalities, including multi-location support, customizations, performance and more alongside with developing new features, new reports, and integrations. Bringing our member-facing tools (Member Portal, Mobile App, OfficeRnD Rooms, etc.) to a new higher level will be the focus in Q3 & Q4 of 2019. 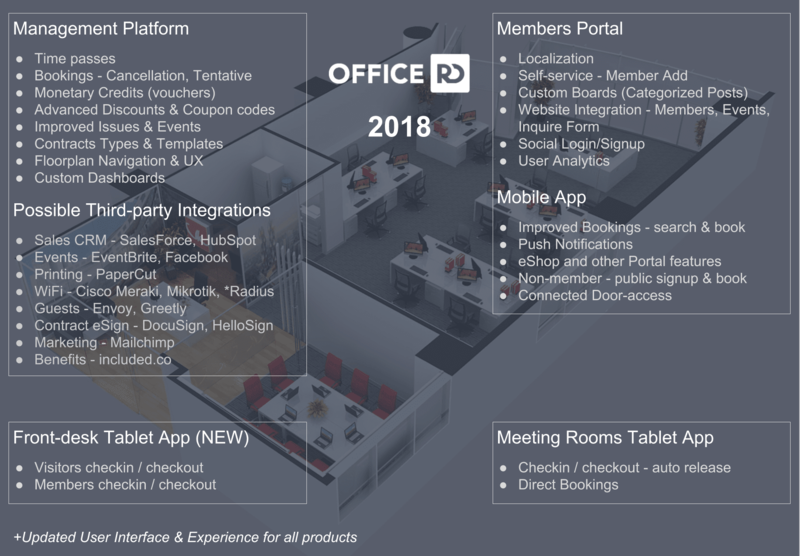 Complete redesign of the Members portal, new functionalities in the Mobile App and OfficeRnD Rooms will help you bring your community further than ever before. Expanding our serviced office management feature set objective is related to expanding on our Contracts story, adding more billing capabilities, such as charge sheets, improving our provisional bookings story and adding more reports and dashboards. And last but not least our efforts of making OfficeRnD the easiest to onboard and extend platform will cover data importing improvements, extending our API, adding better app-to-app authentication, and new hosted door access integration capabilities. And because we know you will be excited to know when you can expect all of these goodies here is a visual timeline* which will help with that. *We are doing our best to execute on our planned timeline but we live in an agile and flexible world and sometimes our plans change along the way. You can connect with me at martin@officernd.com if you want to discuss our roadmap. I’d love to hear your thoughts and ideas. We’ll continue to innovate and create better management capabilities, more automation, and better integrated and connected flexible workspace. Please, note that these are direct integrations we’re planning to work on over the next months but we can’t commit that they will all fit into 2019. We are more committed than ever to providing the best and most complete digital user experience for your members. That’s why a big part of our Roadmap for 2019 is geared toward your Members. New User Interface and Improved Experience. Social Login – allow your members to login or signup with their connected social profiles, such as Google, Twitter, etc. In 2019, we’ll be aiming to connect more and more points of your shared workspace. Of course, a huge part of our planned work for 2019 is to continue improving all the existing functionality, integrations and better support you and your growing businesses. Even more, we’re already working on big User Interface & Improved Experience face-lift that will span through all our products, from the Management platform to the Mobile app, Member portal, and all Extensions. It is going to be Great! These are a lot of items, right? Sure, they are. But our growing team and drive to completely connect your flexible workspace motivate us even more to continue our amazing product journey. R&D Roadmap 2018 is big. Localization, time passes, social & website integrations, improved issues, events, contracts, floorplans, billing & discounts. Improved mobile app – search & book, non-member view, shop and more. New front-desk table app for member & guest check-in and more. The next major update of OfficeR&D will come up with lots of improvements, new features, and many new integrations.